This popcorn headband pattern offers up a beautiful textured lace. It is worked in one piece from start to finish and ties at the back for a comfortable fit. 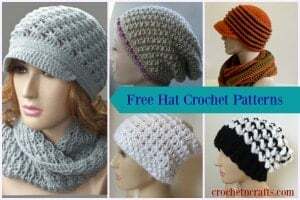 It is great for all hair types and makes for a quick crocheted gift for someone on your list. I used a brown yarn because that just goes with what’s in my closet. But it would look great in any colors, including a white for weddings, or in black to go with that fancy black dress that’s just waiting to be worn at your next dinner party. Although it’s an intermediate pattern, it’s not hard to make if you know how to make the popcorn stitch. As for the design, it starts with the band that fits over the head, then you make the edging and tie strings without fastening off. 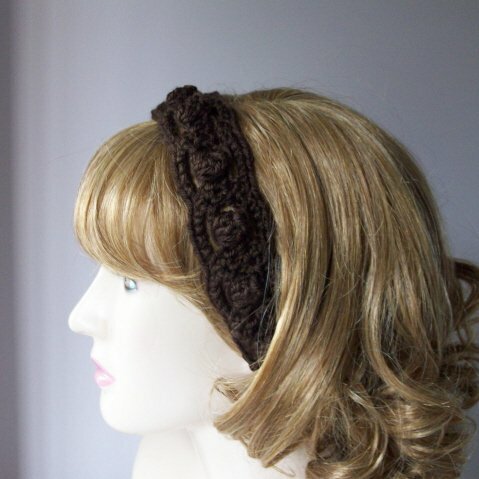 You might also enjoy this wide crochet headband or this easy breezy headband. Popcorn Stitch: Work 5 dc in ch indicated, remove hook from loop, insert hook in first dc of 5 dc sts made, pick up the loop and pull through. Ch 53, or any multiple of 5 plus 3. Row 1: Sc in second ch from hook and in next ch, *ch 3, sk next 3 chs, sc in next 2 chs, repeat from * to end of row. Turn. Row 2: Ch 2, dc in first 2 sts, *ch 1, sk next ch, work popcorn in next ch, ch 1, sk next ch, dc in next 2 sts, repeat from * to end of row. Turn. Row 3: Ch 1, sc in first 2 sts, *ch 3, sk next ch, sk popcorn st and next ch, sc in next 2 sts, repeat from * to end of row. Turn. Working on the Right Side, sl st into next st, *ch 1, 5 sc in first ch-3 sp and into each sp to end, sl st into next 2 sts and working your way around the corner, sl st into center of dc st. String: Ch 31, working into back bumps, sc into second ch from hook and into each ch to end, sl st into corresponding st along end,* working your way around the corner, sl st into next 2 sts. Repeat from * to * once, fasten off.